The First MiG-15 Flight in Europe – Fly a legend! We are very proud to present you our newest offer – a flight in the MiG-15 Fagot (or Lim-2, as it was built in Poland under license). The MiG-15 is not only a true classic and a legend – it is also very very powerful. The MiG-15 is smaller but about 3 times as powerful as the L-39 Albatros. The swept-wing fighter jet MiG-15 Fagot achieved fame in the Korean War, where it outclassed all straight-winged US fighter aircraft. The so-called “MiG-Alley” around the Yalo river between North Korea and China is known for it’s numerous dogfights with MiGs. They have been flown by Soviet pilots also, although officially only by Chinese and Korean pilots. The Soviets claimed that they destroyed 1,106 UN aircraft with the MiG-15 while the Allied forces say the MiG-15 destroyed 142 aircraft. Even Western experts acknowledge that many Soviet fighter pilots earned bigger scores than their American counterparts. Soviet pilot Semyon Fiodorovich Jominich achieved the first jet-vs-jet victory when he shot down Frank Van Sickle in his F-80C Shooting Star. It is assumed that over 18,000 MiG-15, including foreign MiG-15 aircraft, have been built under license. The MiG-15 has a never-exceeding speed of Mach 1. We already had the chance to fly that beast – it is just stunning! The MiG-15 flight is not only something really new in Europe – it is by far the most powerful fighter jet available for tourist rides within the European Union. As described above, the Mikoyan MiG-15 is about 3 times as powerful as our “standard jet”, the Aero L-39 Albatros. You’ll feel the power when the MiG-15 accelerates on the runway – the power is just incredible. The MiG jet is more or less a flying powerful jet engine with a small cockpit on top. Flights in the MiG-15 two seater are very interesting not only for people interested in classic and historic military aircraft, they are also a very good choice for everybody seeking an adrenalin kick. The Air Base where the MiG-15 is operated from is located near a town full of Air Force veterans. They love the sound of the old MiGs so much that you can expect harsh reactions if they hear the MiG-15 was flying without saying hello to them by flying very low over their houses. No joke! So you’ll have to do a mandatory low level flight over the centre of the town (which is fun!). The MiG-15 has dual control and two fully equipped cockpits – you’ll be able to control the MiG-15 during the flight. You can even do aerobatics yourself. As with all our offers, the aim is always to make you as happy as possible. If you have preferences, let the pilot know. He is there to make you happy. Where can I fly the classic MiG fighter jet? Flights take place in the east Polish town Biala Podlaska, close to Belarus and about 2 hours from Warzaw. Don’t worry, we won’t provoke the air defence of Belarus during our flights. Biala Podlaska Air Base is a very large Air Base and hosted hundreds of MiG fighter jets during the Cold War era. Transfer from Warzaw can be organized. On the way from Warzaw to Biala Podlaska, you’ll drive along 23rd Air Base (Polish: 23 Baza Lotnicza), the Minsk Mazowiecki Air Base, where the 1st Air Tactical Squadron of the Polish Air Forces operates supersonic MiG-29 fighter jets. If you are lucky, you’ll see some MiG-29s flying the day you’ll fly their grandfather. How can I book a MiG-15 flight? It’s very easy. Just contact us with the form below. A 20 minutes flight costs EUR 2,999.00. In this price everything is included: insurance coverage for the flight, all taxes and fees, preparations and equipment. Longer flights can be organized, but for most passengers 20min is really enough. 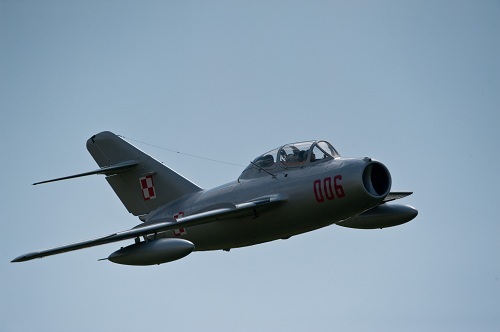 The MiG-15 in Poland is currently NOT available, sorry! Please fly the MiG-15 in Czech Republic instead.